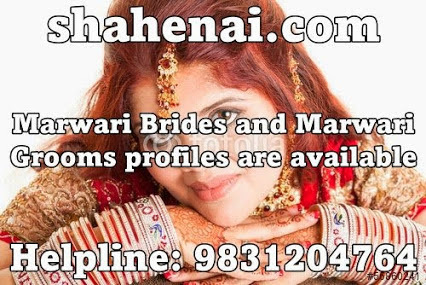 Marwari Brides,Marwari Grooms and Marwari Matrimonial—Marwari or Marwadi community originates from the Rajasthan region of India.Their language is also called Marwari. They are business minded and are famous for their honesty. In the time of wedding Marwari families prefer matchmaking within their community.Agarwals, Khandelwals, Maheshwaris,Oswals, Mahawar,Vaishya,Poddars are fall under majority among the Marwari community.Generally Marwari Matchmaking is strongly based on social and financial status of families.Marwari Weddings are an ostentatious affair and are carried out in a traditional manner. Engagement/Tika Ceremony-Tika ceremony takes place at the groom’s place.In this ceremony the brides brother applies a tilak or tika on the groom’s forehead and makes the alliance or engagement official.A sword and other gifts including clothes,fruits,sweets etc are also given to the groom. Ganapati Sthapana and Griha Shanti Ceremony-Usually a few days before the marriage a havan is conducted by the bride/groom family,which involves the installation of the idol of Lord Ganesha. Pithi Dastoor Ceremony(Ban)- Application of turmeric and sandal wood paste to the bride and groom. Custom goes that once the pithi starts the bride and the groom cannot leave the house.The pithi dastoor at the bride's house is an elaborate affair. The bride dresses in a traditional orange poshak and is then brought under a silken canopy, which is held with the help of swords on the four corners by four ladies who must belong to the same clan as the bride. She is brought to the ladies gathering, who then apply the paste to her. A similar ceremony takes place at the groom's house as well, although it is not as elaborate. Dholans (women singers with dholak) sing auspicious pre-wedding songs while the ceremony is in progress. It is interesting to note that dholans are omnipresent in throughout the Marwadi wedding celebrations. They are accompanied by the Shehnai and the nagara players. Mehfils-Mehfil ceremony usually takes place in the evening .Separate mehfils are organized for the women and the men.At the ladies mehfil all women relatives and friends wear gorgeous outfits and gather in a hall and perform the ghoomar (a special dance done in a group).The bride at the mehfil is given an important position to sit and watch the proceedings.And at the male mehfil male members of the family and friends performs song and enjoy themselves. Mahira Dastoor-This ceremony is common to both the bride and the groom’s families.This ceremony is performed by the maternal uncle(Mamuji)of the groom/bride,who along with his wife and family arrives with much fanfare and is received by the bride and groom’s mother with the traditional welcome.The uncles then gives clothes,jewellery,sweets etc.to the entire family and relatives. Janev Ceremony-According to the custom, in this ceremony the groom has to wear saffron robes like an ascetic and perform a havan before wearing the thread. The saffron robe denotes that the groom has two options before him—either he renounces the world to become an ascetic or he happily accepts the marriage and its responsibilities. Once the havan is completed and the thread given, the groom then enacts as if running away from the marriage while the maternal uncle must catch his nephew and convince him for the marriage. Palla Dastoor-On the wedding day or a day prior to it,the palla dastoor is brought in by groom’s relatives to the bride’s house . Palla dastoor means clothes, jewelery and gifts from the groom which the bride wears during the wedding ceremony. Nikasi-In a Marwadi wedding the groom has to wear a padqi or a headgear which is tied by the jija or sister’s husband.The also also wears “pecha”,”kalki” and tani.A sehra either made of flowers or of pearls is tied to the padqi of the groom.The groom’s sister-in-law (brother’s wife) then applies kajal in his eyes.After this,the groom’s sisters tie golden threads to the reins of the mare and this ceremony is called “vaaq-gunthai”.When the sister performs the ritual,her husband holds the rein of the horse.As a custom,the groom first pays a visit to the temple before proceeding for the bride’s house. Toran-The entrance of the girl’s house is adorned with a toran which the groom has to hit with a neem stick.This is a custom and this ceremony is known as ‘toranachar’ which symbolizes wardind off the evil eye.After this the girl’s mother does aarti and puts tilak on the groom’s forehead. Jaimala-Here the groom is taken to the dias where this ceremony is performed.As a custom in Hindu marriages both the bride and groom exchange garlands.This is the first step of the wedding rituals. After jaimala or varmala ceremony ,the bride and groom is taken to another mandap where they perform rituals related to phera. Granthi-Bandhan-This ritual means tying the knot which is either done by the priest or the sister of the groom.In this ritual the cloth tied around the groom’s waist is tied to the chunni of the bride which signifies union of two individuals. Paanigrahan-This is followed by paanigrahan ceremony where the groom takes the bride’s hand in his hand signifying a symbol of pious union and staying together in both good and bad times. Pheras-Then the bride and the groom take pheras by going around the fire.In a Marwadi wedding only four pheras are done in the mandap while the rest of the three pheras are performed at the entrance.According to the tradition,in the two pheras the girl is in the front and in the other two the boy leads. Ashwarhrohan-In this ceremony the bride puts her feet on a grinding stone symbolizing steadfastness and facing every challenge with courage. Then the brother of the bride put kheel or puffed rice in the bride’s hand,whichis then passed to the groom’s hand and then offered to the fire.This rituals denotes brother’s happiness and and wishes of prosperity for his sister and her husband. Vamang Sthapana and Sindurdaan-Here in this ceremony the groom requests the bride to sit on his left side,as the heart is in the left side of the body.This ritual denotes that the groom is accepting the bride and establishing her in his heart.After this follows the sindurdaan ceremony where the groom fills the brides forehead with sindur or vermillion.Sindur is considered as the most auspicious part of hindu woman’s married life. Saptapadi-After this saptapadi is carried where the bride and the groom walk seven steps together.This ritual signifies that till now they have walked alone but from now onwards they will walk together in every field of life.While performing the custom,both bride and groom utter seven mantras which are in fact promises,they make regarding their conduct towards each other.After this pherpatta is done which signifies that the bride can now freely proceed to her in-laws house.Then the sister of the groom performs sargunthi or adorning of the girl’s hair.This denotes acceptance of the bride by the groom’s family. Aanjhala Bharaai—This is a ritualistic tradition where a bag full of money is put in the new bride’s lap by her father in law .This his way of welcoming the new bride into his family and also making her aware of her family responsibilities.Then the bride distributes some part of the money to her sister in law and her husband.After this the new couple get up from the mandap while the elders bless them when the couple touches their feet. Paharavani—After this the groom is then made to sit on a new cloth or asana and is welcomed by a tika.He is given gifts in the form of money,clothes and other things for his personsl use.A silver utensil or kachola is given to the groom’s father.Then the women members of the bride’s side take the groom for fun filled shloka-kahalai where he is made to recite poems or dohas.After this the bride worships the threshold or dahleez of her paternal house and breaks an earthen diya on it.The groom and the bride are escorted out and they leave for the groom’s house. Bidai-During the time of the bidai a coconut is placed under the wheel of the car before the bride lifts the veil for the husband after the wedding.At this time the groom usually gives a piece of jewelery to his bride. There are some interesting post wedding rituals of Marwari wedding. Grihapravesh-Grihapravesh takes place in the groom’s house once the baraat returns with the newly weds.The bride still wears the veil while the puja and other ceremonies take place. Pagelagni-This ritual takes place the day after grihapravesh.In this ceremony the bride still in her veil,is formally introduced to all the family members of the groom who bless her with gifts. The veil is then finally removed.Other post wedding ceremonies include chura where the mother in law presents bangle to the bride.During the mooh dikhai the bride gets a chance to get acquainted with all her new family members one by one.